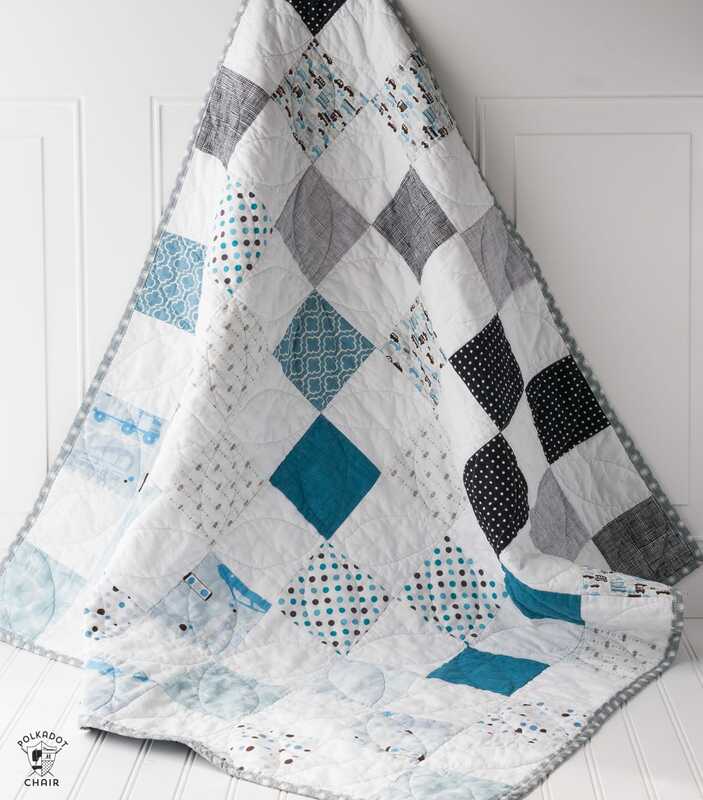 Today I’m going to share with you a Color Blocked Patchwork Baby Quilt Tutorial. It’s a very simple design, no need for a pattern. The blocks are arranged in color order with the darkest at the top going down to the lightest at the bottom. 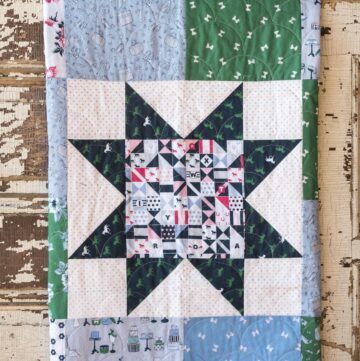 If you like this pattern you may also like this Sawtooth Star Baby Quilt Tutorial. 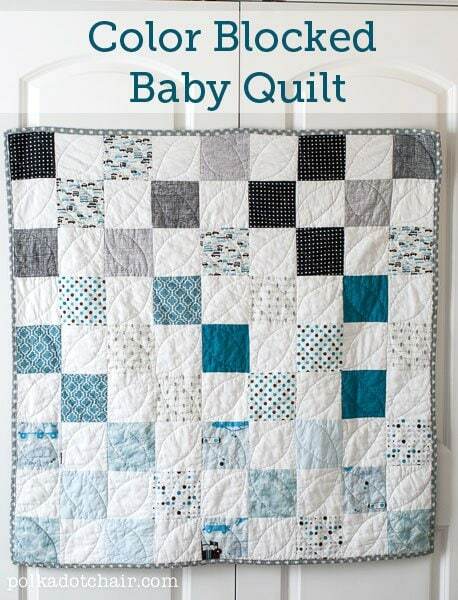 If you’re looking for an easy baby quilt that you can make, I think that you’ll like today’s tutorial. I made this quilt for a friend of mine who recently had a baby boy. All of the fabrics I used in the quilt were from a custom created fat quarter pack that I purchased. 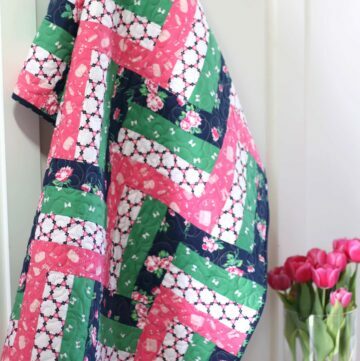 This quilt would be a great one to use up some of your fabric stash. Just pull a selection of fabrics in light, medium and dark blues. It also looks great with a pop of black. -40 pre-cut 5” x 5” squares. Cut 41 squares from your various prints. Arrange by color value. Darkest, Mid, Light Colors. As you sew, keep your darkest colors in rows 1,2 then gradually lighten as you work down the rows. Odd-Numbered Rows start and end with a print. Even numbered rows start and end with a white square. There are 9 rows. For odd numbered rows, sew nine 5” x 5” squares together alternating print and white starting and ending with a print. Do this for rows 1, 3, 5, 7, 9. Press seams to the right. For even numbered rows, sew nine 5” x 5” squares together, alternating white and print. Starting and ending with a white block. Do this for rows 2, 4, 6, 8. Press seams to the left. Quilt and bind as desired! I quilted mine using the Dogwood quilting pattern The backing is flannel (my favorite for a baby quilt). It’s bound using 2 1/2” wide strips. 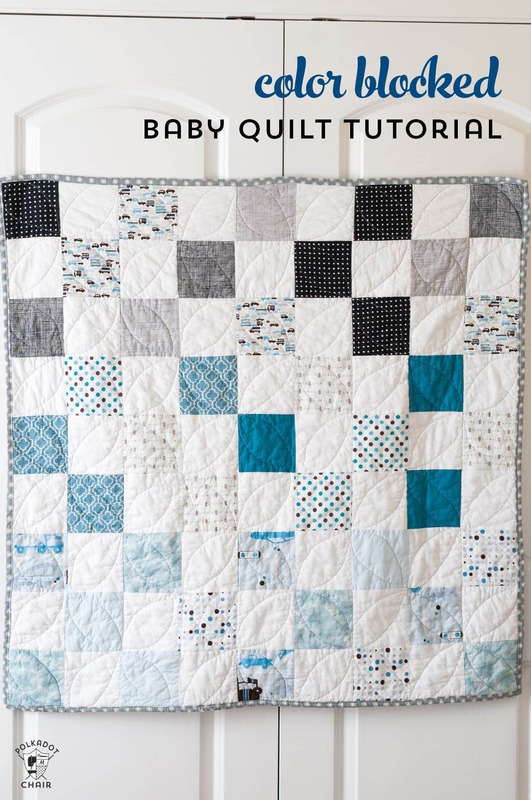 Rail Fence Baby Quilt Tutorial - Beginner Friendly! 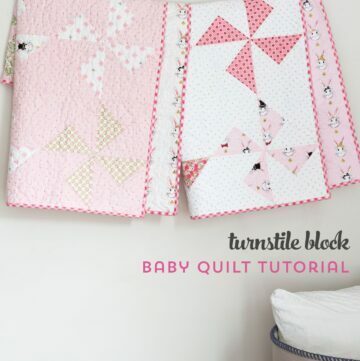 Free Baby Quilt Patterns featuring simple Turnstile Quilt Blocks! So are the precut 5×5 the white? And I assume you mean to begin and end with white on the 2, 4, 6 and 8 rows? Great quilt, I love it. I want to do one just like it tonight! Thank You. Yes!! Thanks for catching that! I read over it a few times and totally missed the typo! I’ve corrected it now. Simply stunning! 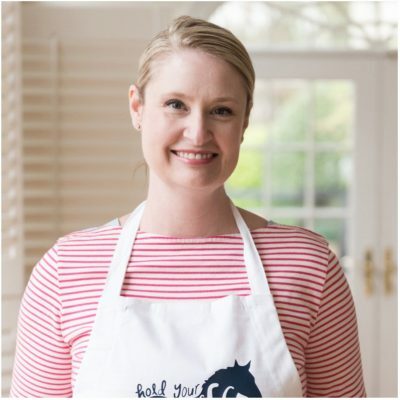 I love it when simple is the right choice… and this is it! 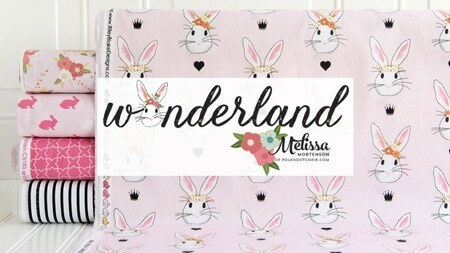 I’ve been searching on Fabricworm for the fabrics you used because I love them and am going to have my mom make this for our little boy that’s coming in December. I can’t find these prints. Do you know who the designer was or how long ago you got them? This is so cute! I’m a beginner at sewing and I’ve never quilted before, but you’ve inspired me to give it try (with some help, of course!). This would be an excellent quilt to start with! Very easy to piece together! I am soon to start a quilt for my little man, and I drew some of my inspiration from your quilt here. Right now, I am in the planning and development phase, as I am working on a quilt with someone else as a gift, as well as baby shower decorations, all with a two month old! 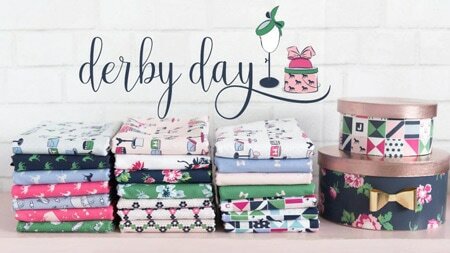 Thank you for your amazing post, I only wish I was able to get 20 5″ squares from my fat quarters, I can only get 12, since they did not cut them at 90 degree angles. Oh well. Try Missouri Star Quilt Company online. 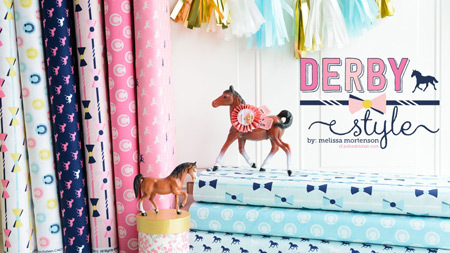 They have a great selection of precuts in 5″ squares, 2 ½” strips, and other sizes/shapes. 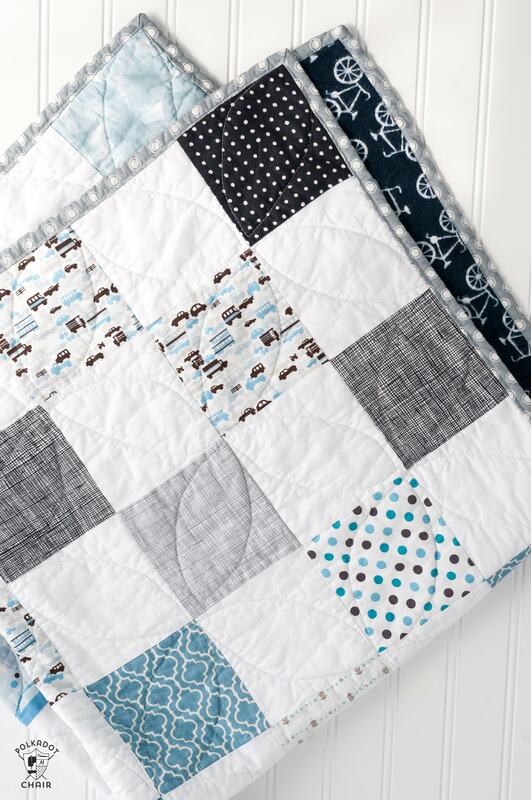 But you can cut your own 5″ squares from yardage for this cute quilt. Is this blanket backed with the navy Michael Miller or grey? I am thinking of using this pattern for a baby quilt for my sister. What are the finished dimensions? I have just finished piecing together the top of my quilt. What type/ thickness of batting did you use? This is my first attempt at a quilt! How come it says you need 40 5×5 blocks but if you have 9 rows with 9 blocks each row than that would be 81 blocks. Just want to clarify how many blocks I am going to need. I think you need 40 print squares and 41 white squares or vice versa. The 40 blocks refer to the PRINT blocks you need to cut. You don’t need to cut the white blocks since they are precuts that are white. Hi Alyssa. I see there was no answer. Did you figure this out? How much batting should be used in this quilt? I don’t see an amount or anything in the directions. Thanks! It would be close to whatever the backing requirement is. Can you please show the back? Thanks! Hi Melissa, this is so cute! 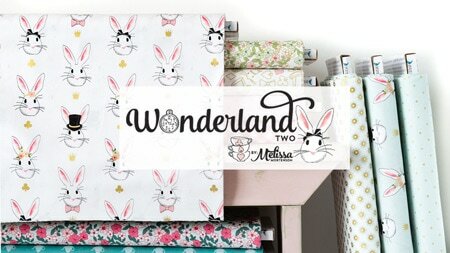 I will try to make this for a baby shower and I have just bought my print fabric today. Do I need to prewash the fabric? It’s up to you. Personally I never prewash my fabric. But it won’t hurt if you do. Lovely quilt. i am doing one similar but wonderful what colour thread you used? It doesn’t appear to show up on any other different coloured squares. 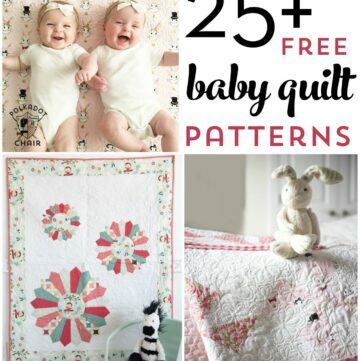 What is the finished size of the baby quilt? I like the design but want to make it as a queen. Thank you.